Some officer gave an intro speech that it was a medical camp and people could come and participate. Then some NPCIL officials asked the residents what they wanted such as roads etc. The baffled people could not make anything out of this absurd drama. The officials collected some signature, took a lot of photos and left the scene in a hurry and then announced to the media that the Koodankulam nuclear power project disaster training was conducted satisfactorily. The People’s Movement Against Nuclear Energy (PMANE) condemns this secretive, illegal and fake disaster management training session conducted at Nakkaneri village just to create false records that they had satisfied the AERB requirement before they could load the nuclear fuel rods. This is a dangerous and inhuman thing to do that jeopardizes the safety and wellbeing of hundreds of millions of people in the southern tip of India. It has been our persistent demand that safety drills and evacuations exercises be conducted in every village and town in the 30 km radius of the Koodankulam plant. It is pertinent to note here that the Koodankulam reactors are the largest in the country; the first light water reactors in India; and foreign reactors imported from Russia without any local technicians to manage them. Even now the NPCIL authorities have brought in technicians and engineers from Russia and Croatia to deal with these machines. More importantly, these draconian reactors are being set up in the midst of a highly and densely populated part of the country. Most of the local people cannot read and understand the English reports and much of the info on the Koodankulam plants have not been shared with the local people. The Tirunelveli district administration should explain to the people why they did not announce the disaster management exercise to the people well ahead and why they did not invite the press. The district and state administrations should desist from this kind of anti-people and illegal practices and work openly, transparently and responsibly. After all, we are part of democratic India and not dictatorial Soviet Union. 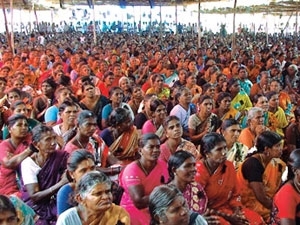 « Insulting Lankan VIPs in Tamilnadu amounts to insulting Tamil culture!